Very little barriers to entry to protect the businesses above, all owned and operated by Move Inc. This underperformance is no small feat - in the S&P 500, only 25 of the 500 index companies have gross margins at or above Move Inc's. Move Inc reported earnings last night, or lack of earnings. Hey, it was an improvement from last year at least. "Net loss applicable to common stockholders was $758,000, or $0.00 per share, compared to a net loss of $22.7 million, or a loss of $0.15 per share in the third quarter of 2008." 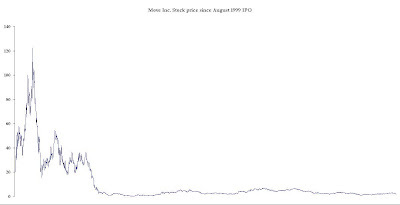 "Move's Adjusted EBITDA (earnings from continuing operations before interest, taxes, stock-based compensation and charges, depreciation, amortization and other non-recurring charges) on a non-GAAP basis for the third quarter of 2009 was $5.6 million, or 11% of revenue, compared to $5.7 million, or 9% of revenue, for the third quarter of 2008." That would be fine if it were just Depreciation and Amortization add-backs, but it includes a HUGE increase in stock compensation. Management is simply shifting people's focus to a malleable metric, to show some semblance of profitability. 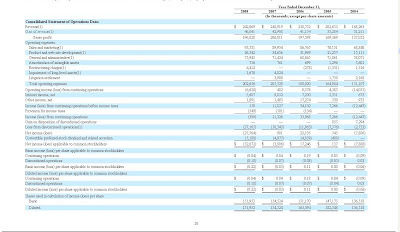 Worrisome to me is this large chunk of equity compensation, and dilution to holders down the road. Whether they pay people in stock or cash, it is simply disgusting to see this company with enormous gross profits continue to spend so lavishly on compensation and god knows what else. Shares are off about 15% today. In addition to lousy forward earnings guidance, ThinkEquity dropped their rating to Hold from Buy. Needham kept their HOLD rating, citing the total lack of earnings or even "adjusted EBITDA" outlook. Sickening to see all that revenue and gross profit gone to waste.